A superb text on the fundamentals of Lebesgue measure and integration. This book is designed to give the reader a solid understanding of Lebesgue measure and integration. It focuses on only the most fundamental concepts, namely Lebesgue measure for R and Lebesgue integration for extended real-valued functions on R. Starting with a thorough presentation of the preliminary concepts of undergraduate analysis, this book covers all the important topics, including measure theory, measurable functions, and integration. It offers an abundance of support materials, including helpful illustrations, examples, and problems. To further enhance the learning experience, the author provides a historical context that traces the struggle to define "area" and "area under a curve" that led eventually to Lebesgue measure and integration. 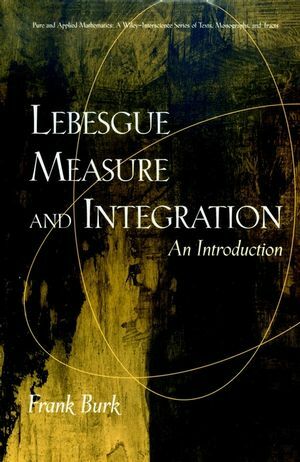 Lebesgue Measure and Integration is the ideal text for an advanced undergraduate analysis course or for a first-year graduate course in mathematics, statistics, probability, and other applied areas. It will also serve well as a supplement to courses in advanced measure theory and integration and as an invaluable reference long after course work has been completed. FRANK BURK teaches in the Department of Mathematics at California State University.